If decades of being the industry leader in South Africa’s glass packaging industry has taught us anything, it’s that happy employees are an indispensable ingredient to business success. As one of South Africa’s top employers, it has always been one of our strongest values to provide the kind of workplace that emphasises employee safety, satisfaction and mutual respect in the way we work. Read the full Code of Ethics below, that has guided Consol’s employee relations policy from the very beginning. This Code of Ethics bring together the corporate practices applied by the Company in the conduct of its affairs. Care has been taken to ensure that it has been taken to ensure that it has been prepared in sufficient detail to give clear guidance to the behaviour of all employees. Evidently, more detailed or additional rules may be required from time to time by management or by statute. These, supplemented by business unit specific codes of conduct, must be communicated through existing procedures and channels within the various operations. All employees are requested to take careful heed of the contents of this Code, and to ensure that they comply both with the written word and its spirit. All share equally in the responsibility to uphold this Code and to take action if it is believed that it is not being followed. Consol and all its subsidiaries are committed to a policy of fair dealing and integrity in the conduct of their business. This commitment, which is actively endorsed by the Consol Board of Directors, is based on a fundamental belief that business should be conducted honestly, fairly and legally. The Company expects all its employees to share its commitment to high moral, ethical and legal standards and therefore to actively reject any business practice which might reasonably be deemed to be improper. The Code is designed to inform employees of the Company's policies in various areas. Compliance with it by all employees is mandatory. If employees become aware of, or suspect, a contravention of the Code, they must promptly and confidentially advise the Company as set out in the Contravention of the Code section of this document. If employees are in doubt about the application of the Code in any instance, they should discuss the matter with the person to whom they report or a person at the management level responsible for the human resources or legal function. Consol supports the development of an ethical free-market system. The Company will not condone any violation of the law or unethical business dealing by any employee, including any payment for, or other participation in, an illegal act. All employees must ensure that their conduct cannot be interpreted as being in any way in contravention of applicable laws and regulations governing the operation of the Company. Employees must bear in mind that the perception of their actions by others is important, and should act accordingly. The Company expects employees to perform their duties conscientiously, honestly and in accordance with the best interests of the Company. In addition, they are required to foster the highest possible standards of professional competence amongst employees and to optimise the use of resources for which they are responsible. Employees must not use their positions, or knowledge gained through their employment with the Company, for private or personal advantage or in a manner that a conflict or an appearance of conflict arises between the Company's interest and their personal interests. All employees are obliged to formally declare any actual or potential conflict of interests. If employees feel that a course of action which they have pursued, are pursuing or are contemplating pursuing, may involve them in a conflict of interest situation or a perceived conflict of interest situation, they must immediately make all facts known to the person to whom they report. It is a condition of employment that employees may not, without making full disclosure and obtaining permission from the relevant Human Resources Director, take up extraneous employment in any other business or undertaking other than that of the Company. Employees who hold, or have been involved to hold, outside directorships or other offices, or who acquire any business interest or participate in any activity outside the Company, should take particular care to ensure compliance with all provisions of this Code. When outside business directorships are being considered, prior approval must be obtained from the relevant Appointments and Remuneration Committee. The Company recognises that relationships with clients, customers and suppliers give rise to many potential situations where conflict of interest either real or perceived, may arise. All employees of the Company are specifically urged to be vigilant of and to report any instances of bribery or corruption. Employees must ensure that they are independent, and are seen to be independent, from any business organisation having a contractual relationship with the Company or providing goods and services to the Company. Conflicts or interest can arise where employees are offered gifts, hospitality or other favours which may, or could be perceived to, influence their judgement in relation to business transactions. Occasional personal hospitality such as tickets to local sporting events or theatres, provided that contributions towards the transport and accommodation, in particular towards flights, holidays and overseas trips or assistance in kind, are not permitted. Employees are obliged to disclose, by means of a register to be submitted to their senior manager on a quarterly basis, all gifts, hospitality and/or favours of material value received during that period. Any deviations from the code are to be specifically authorised by an appropriate manager. When employees have any doubt whether a gift, hospitality or favour is acceptable in terms of this Code, they must make all facts known to the person to whom they report. No personal favours or other preferential treatments should be accepted by any employee when they are offered because of the employee's position with the Company and, therefore, might tend to place the recipient under obligation. Employees are obliged to report all such incidents. Any gift or sponsorship, which may be construed as a bribe will be treated as such by the Company. Similarly, employees must take care to ensure that when they officially host clients, customers, suppliers or any other business associates, they do so in a manner which would not be considered overly lavish or not in keeping with the spirit of this code. Further, arrangements should be made to ensure the safety of participants and their compliance with laws such as those governing road traffic. The Company respects the right of all employees to make personal investment decisions as they see fit provided that these decisions do not contravene the provisions of this Code, any applicable legislation or policy or procedure established at the various operations of the Company. Employees should ensure that no investment decision made for their own account could reasonably be expected to influence adversely their judgement or decisions in the performance of their duties on behalf of the Company. Non-executive directors must notify the Consol Board. Executive directors and senior employees must receive written clearance from the Consol Group Managing Director. The Company remunerates employees based upon formal remuneration scales and rates for salaries, wages, fringe benefits, and other regular remuneration. No employee may receive commissions or other remuneration related to the sale of product of the Company, except as specifically provided under an individual's terms of employment. Employees may not receive any money or item of value other than regular remuneration and incentives either directly or indirectly, for negotiating, procuring, recommending or aiding in any transaction made on behalf of the Company, nor have any direct or indirect financial interest in such a transaction. The Company encourages the personal participation of its employees in the political process and respects their right to absolute privacy with regard to personal political activity. The Company will not attempt to influence any such activity provided there is no disruption to work-place activities and it does not contribute to industrial unrest. Company funds, goods or services, however, must not be used as contributions to political parties or their candidates, and Company facilities must not be made available to candidates or campaigns. All employees who have access to Company funds and property in any form must at all times follow prescribed procedures to recording, handling and protecting such. Employees must at all times, ensure that the Company's funds and property are used only for legitimate Company business purposes. Where an employee's position requires Company funds to be spent, it is the individual's responsibility to use good judgement on the Company's behalf and to ensure that appropriate value is received by the Company for such expenditures. Any inventions, copyrights, patents or other intellectual property which may arise out of employment with the Company and/or use of Company facilities will automatically become the property of the Company without exception. If employees become aware of any evidence that the Company's funds or property may have been used fraudulently or improperly, they should immediately and confidentially advise the Company as set out in this Code. Accurate and reliable records of many kinds are necessary to meet the Company's legal and financial obligations and to manage its affairs. The Company's books and records should reflect all business transactions in an accurate and timely manner. Undisclosed or unrecorded revenues, expenses, assets or liabilities are not permissible, and the employees responsible for accounting and record-keeping functions are expected to be diligent in enforcing proper practices. The Company strives to achieve complete, accurate and timely communications with all parties with whom it conducts business, as well as government authorities and the public. In addition, prompt internal communication is encouraged. The Company's position on public policy or industry issues will be dealt with by senior management. The text of articles for publication, public speeches and addresses about the Company and its business should be reviewed in advance with the employee's supervisor or individual responsible for public affairs. No communication of a price-sensitive nature may be conducted by any director or employee of the Company or any of its subsidiaries with analysts, the media or investors during a "closed period" as defined in this code. Only such information as is necessary to the company's business should be collected, used and retained. When personal information is needed, wherever possible it should be obtained directly from the person concerned. Information with regard to any confidential product, plan or business transaction of the Company, or personal information regarding employees, including their salaries, must not be disclosed by any employee unless and until proper authorisation for such disclosure has been obtained. Contrary to the Company's interest. Limited, occasional or incidental use of electronic media for personal, non-business purposes is acceptable, however, employees must demonstrate a sense of responsibility and must not abuse the privilege. The Company will routinely monitor usage patterns for both voice and data communications. It reserves its right to review any electronic files and messages to the extent necessary to ensure that electronic media and services are not excessively used for personal purposes and that their use is in compliance with the law and this Code. Any actions taken by the Company in this regard shall comply with relevant legislation. The Company regards any contravention of this Code or any generally accepted standards of workplace conduct and behaviour as a serious matter which must be dealt with immediately. At the same time, any suspected or alleged contravention under investigation must be treated with utmost confidentiality. If employees feel that their own actions have, or may have, contravened the Code, they should either advise the person to whom they report or to a person at management level responsible for human resources, group internal audit, security or legal compliance. All employees are obliged to report any instances where bribes are offered. 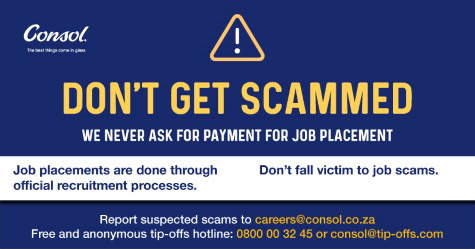 If employees suspect that a contravention of the Code has been committed by another employee of the Company, they should promptly and confidentially report this, preferably in writing, to the Company or to any organisation contracted by the Company for the purpose of receiving and following up such information such as Tip-Offs Anonymous. As contravention of the Code is a serious matter, it may result in disciplinary action, including the termination of employment. Certain breaches of the Code ie; those relating to theft, fraud, defalcation and misappropriation of property, cash and/or services, may also result in civil or criminal proceedings.